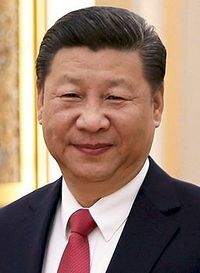 Xi Jinping (born June 15, 1953) is the President of the People's Republic of China, current General Secretary of the Communist Party of China. He is also Chairman of the Central Military Commission. In 2013, he became the president and the General Secretary of the Communist Party of China. He has made comments in favor of globalism. Xi Jinping is an atheist. He is very opposed to Christianity and has increased persecution of Christians. Atheism is a core tenet of militant communist ideology (see: Atheism and communism). In 1955, Chinese communist leader Zhou Enlai declared, "We Communists are atheists". ↑ Martel, Frances (November 5, 2018). Xi Jinping: Globalization Will Happen ‘Independent of People’s Will’. Breitbart News. Retrieved November 7, 2018. This page was last modified on 7 November 2018, at 09:52.